Castor oil plant, or castor bean plant, is the common name for a wind-pollinated flowering plant, Ricinus communis, of the Euphorbiaceae family, characterized by large, palmately lobed leaves, flowers during most of the year in dense terminal clusters, with female flowers above the male flowers, and clusters of spiny, red to bronze fruit or seed capsules that contain seeds with intricate mottled designs. The seeds are the source of both the commercially important castor oil, which has medicinal and industrial uses, and the extremely poisonous ricin, which has been used as a biochemical agent. The seed commonly is known as the castor bean, although it is not a true bean. The castor seed has a long history of use. Castor seeds have been found in Egyptian tombs dating back to 4000 B.C.E., being used mostly to fuel lamps because of the slow burning oil. Herodotus and other Greek travelers have noted the use of castor seed oil for lighting, body ointments, and improving hair growth and texture. Cleopatra is reputed to have used it to brighten the whites of her eyes. In the Ebers Papyrus, an ancient Egyptian medical treatise, castor oil is described for medicinal use. Its use in India has been documented to 2000 B.C.E. Today, castor oil (extracted minus the ricin) is used both internally and externally for medicinal use and for such industrial purposes as in the production of nylon and other synthetic fibers and resins and as a component in motor oil, synthetic flower scents, paint and varnish, insulation, food containers, soap, ink, plastics, insecticidal oils, protective coatings, and so forth. The castor oil plant also has aesthetic and ecological values. It is used extensively as a decorative plant in parks and other public areas, particularly as a "dot plant" in traditional bedding schemes. Ecologically, despite the ricin being poisonous to humans and many animals, including many insects, Ricinus communis is the host plant of the common castor butterfly (Ariadne merione) and the castor semi-looper moth (Achaea janata), and also is used as a food plant by the larvae of some other species of Lepidoptera, including Hypercompe hambletoni and the nutmeg (Discestra trifolii). Among birds, it is a favorite food of the tambourine dove (Turtur tympanistria). Ricinus communis, the castor oil plant, is the sole member of the genus Ricinus and of the subtribe Ricininae. It is a fast-growing, suckering, perennial shrub which can reach the size of a small tree. It grows from 1.8 to five meters (six to 15 feet) tall in one season (Sims and Frey 2005). The leaves are glossy, about 15 to 45 centimeters (six to 17.5 inches) long, long-stalked, alternate, and palmate with five to 12 deep lobes with coarsely toothed segments. Their color varies from dark green, sometimes with a reddish tinge, to dark reddish purple or bronze. Castor oil plants are monoecious, with separate female and male flowers on the same plant. Most of the year these flowers are in dense anicle-like inflorescences (terminal clusters) with the male flowers just below the female flowers, both without petals (Sims and Frey 2005). The male flowers are yellowish-green with many prominent creamy stamens and are carried in ovoid spikes up to 15 centimeters long (Brickell 1996). The female flowers, borne at the tips of the spikes, have a spiny overy (which develops into the fruit or seed capsule) and prominent red stigmas (Brickell 1996). The fruit is a spiny, greenish capsule or seed pod. This seed pod has three sections, or carpels, with each carpel having a single seed. At maturity, the three sections split apart and as the carpel dries, it splits open and the seed is ejected, often with substantial force. The bean-like seeds are large, oval, shiny, and have intricate, brownish designs that differ from seed to seed due to genetic variations. The seeds have a small, spongy structure (caruncle) on one side that assist with absorption of water when the seeds are planted (Sims and Frey 2005). In addition to being found in the seed coat, ricin also is present in lower concentrations throughout the plant. The castor oil plant was given its scientific name by Carolus Linnaeus. Ricinus is a Latin word for "tick." The seed looks like a tick, particularly when the tick is engorged with blood and with the caruncle resembling a tick's head (Sims and Frey 2005). Communis is Latin for "common." 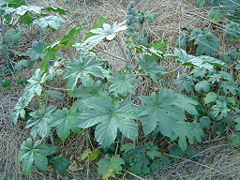 The name castor may have been given to the plant by English traders who related castor oil to the oil of the plant castus (Vitex agnus) (Simon and Frey 2005). It may also come from the plants use as a replacement for castoreum, a perfume base made from the dried perineal glands of the beaver (castor in Latin). It has another common name, Palm of Christ, or Palma Christi, that derives from castor oil's ability to heal wounds and cure ailments. 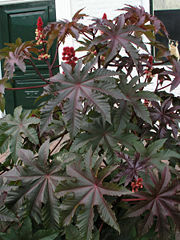 Another plant species, Fatsia japonica, looks similar to the castor oil plant and is known as the false castor oil plant. Although castor is indigenous to the southeastern Mediterranean region, Eastern Africa, and India, today it is widespread throughout tropical regions (Phillips and Rix 1999). Castor establishes itself easily as an apparently "native" plant and can often be found on wasteland. While fast growing, it is not hardy. However, the leaves do not appear to suffer frost damage in sheltered spots, where it remains evergreen. In areas prone to frost it is usually shorter and grown as if it were an annual. Although monotypic, the castor oil plant can vary greatly in its growth habit and appearance. Because the seeds are so poisonous, it is important that people be taught to recognize and avoid the plant; in many cases, the flower heads are snipped off prior to maturity as a protective measure (Sims and Frey 2005). Global castor seed production is around one million tons per year. Leading producing areas are India (with over 60 percent of the global yield), China, and Brazil. Castor seed is the source of castor oil and ricin. The seeds contain between 40 and 60 percent oil that is rich in triglycerides, mainly ricinolein. Ricin is obtained after the oil is extracted, with the oil not containing any of the poison (Sims and Frey 2005). Castor oil has a wide variety of uses and was one of the earliest commercial products (Sims and Frey 2004). Castor beans have been found in Egyptian tombs as far back as 4000 B.C.E. and are mentioned in the ancient Egyptian medical text, the Ebers Papyrus, as a means to protect eyes from irritation. The use of castor seed oil in India has been documented since 2000 B.C.E. for use in lamps and in local medicine as a laxative, purgative, and cathartic in Unani, Ayurvedic and other ethnomedical systems. Traditional Ayurvedic medicine considers castor oil the king of medicinals for curing arthritic diseases. Castor seed and its oil have also been used in China for centuries, mainly prescribed in local medicine for internal use or use in dressings. Today, castor oil is used both internally, as a strong and effective purgative or cathartic, to clear the bowels after food poisoning or to relieve constipation, and externally to treat corns, among other purposes (Sims and Frey 2005). The oil and its derivatives also have numerous industrial uses, being used in a wide variety of products, such as the basic ingredient in racing motor oil for high-performance engines, a fuel additive for two-cycle engines, a primary raw material in the production of nylons and other resins and fibers, and a component in paint and varnish, insulation, fabric coatins, soap, ink, plastics, brake fluids, guns, insecticidal oils, and so forth (Sims and Frey 2004). Ricin is a deadly poison, which has been used as a biochemical weapon. It is highly toxic to humans and other animals, including insects. Ricin causes cell death by inactivating ribosomes, which are the site of protein synthesis. Perhaps just one milligram or less is sufficient to kill an adult person, and just a single ricin molecule is able to inactivate over 1,500 ribosomes per minute, killing the cell (Cornell 2008). The castor oil also has been known to have been used as an instrument of coercion by the Fascist militia (Camicie Nere) under the regime of Italian dictator Benito Mussolini. Dissidents and regime opponents were forced to ingest the oil in large amounts, triggering severe diarrhea and dehydration, which could ultimately cause death. This punishment method was originally thought of by Gabriele D'Annunzio, the Italian poet and Fascist supporter, during the First World War. 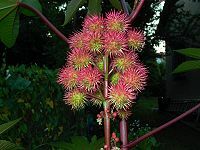 As noted above, Ricinus communis also is planted for aesthetic purposes, with a variety of cultivars produced for such purposes. Brickell, C. 1996. The Royal Horticultural Society A-Z Encyclopedia of Garden Plants. London: Dorling Kindersley. ISBN 0751303038. Cornell University Department of Animal Science. 2008. Ricin toxin from castor bean plant, Ricinus communis Cornell University Department of Animal Science. Retrieved December 16, 2008. Everitt, J.H., R.L. Lonard, and C.R. Little. 2007. Weeds in South Texas and Northern Mexico. Lubbock: Texas Tech University Press. ISBN 0896726142. Phillips, R., and M. Rix. 1999. Annuals and Biennials. London: Macmillan. ISBN 0333748891. Sims, J., and R.J. Frey. 2005. Castor oil. In J. Longe, The Gale Encyclopedia of Alternative Medicine. Farmington Hills, Mich: Thomson/Gale. ISBN 0787693960. Wedin, G.P., J.S. Neal, G.W. Everson, and E.P. Krenzelok. 1986. Castor bean poisoning Am J Emerg Med. 4(3): 259-61. History of "Castor oil plant"
This page was last modified on 22 December 2008, at 21:06.